Rely On Us for Dumpster Services in Ravena & Albany, NY, and the surrounding areas. When trash or construction materials pile up and quickly accumulate, it can be very overwhelming. Whether you are on a construction job site or just doing some spring cleaning, a dumpster service could make your life easier as you complete the project. 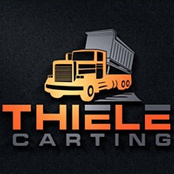 Simplify your project by scheduling dumpster service with Thiele Carting and Plowing LLC today. We'll go over your residential or commercial dumpster rental options in Ravena, NY, and surrounding areas, including Albany, Rensselaer, and Greene counties. Thiele Carting and Plowing LLC provides sturdy, reliable residential and commercial dumpster rentals in Ravena, NY, Albany, NY, and the surrounding areas. We offer different sizes depending on the scale of your project. We work with contractors to provide commercial dumpster rentals for larger projects, but we also accommodate small-scale projects. Call 518-258-3326 today to find out which dumpster size is right for you.